NBP is committed to embedding Sustainability into our core business and providing products and services that contribute positively to local communities. We have an in-house qualified Sustainability Manager who sets out our policies and oversees our Sustainability initiatives and ongoing performance. Nature Based Play prides itself on working collaboratively with clients and the local community. An inclusive process allows for the Nature Based Play design to be reflective of the local site and community needs, whilst providing community ‘ownership’ of the constructed Nature Space. Collaboration and partnerships are very important to NBP, as the process of developing these Nature Scape projects is fundamental in delivering quality products and outcomes for the client and local community. The Nature Based Play spaces we create bring many benefits to the local community and the kids (and carers) that enjoy them. As a business, we support local communities through providing in-kind and collaborative support to their projects, helping them to realise their vision of Nature Play for their community. Research into Outdoor Nature Play and Learning has shown many benefits to kids’ overall wellbeing when enjoying these quality designed spaces. Because of these benefits there is a definite movement into providing more of these quality natures play spaces into local communities and schools. Plus, the kids just love them!!!! Created using natural timbers, features, forms, reflecting the natural environment. Designs encourage and enable kids to play and co-operate together. Provide free flowing play spaces to explore, imagine and shape. Allow for subtle learning of the natural environment, and their own capabilities. ..The Adventure Landscape has been a huge and immediate success. It’s been fantastic to see how quickly the place has embedded itself into the community.. Nature Based Play as a business aims very high in sourcing environmentally friendly materials and resources for our Nature Scape Designs, and in the construction and manufacture process. We specify materials for our designs that are locally sourced, renewable, natural, recycled and reusable. This allows us as a business to reduce Carbon emissions and resource use, reduce waste to landfill and support biodiversity. We ensure our timber and logs only come from sustainable sources, including reusing otherwise discarded logs, and harvesting from the Forrest Commission selecting timbers that would not otherwise be utilized for normal timber production. We select and source trees and logs that are earmarked for mulching, landfill, or burning, saving the logs as a natural resource and capturing carbon. Buying local always goes a long way in reducing environmental impacts on the community, and supporting local communities. We source locally for all our landscaping materials, using renewable products where possible. repurposed for use in our projects. During construction and manufacture we have infrastructure and processes in place to reduce our environmental impacts. Our factory in O’Connor is equipped with a 6.2kW solar panel system, that allows us to produce our own energy, using a minimal amount of electricity from the grid. Up to 75% of our electricity usage is provided by renewable energy. We collect and reuse most of our timber offcuts and milling waste for smaller timber Loose Play parts, reconstituted ground surface, and mulch. Other wastes such as artificial turf/rope offcuts are recycled for reuse on other projects or in the factory. Onsite we use water sparingly, only when absolutely required for construction, and in the factory, clean down items with compressed air instead of water where possible. Vehicles are cleaned at car washes with reused water. All the timber finishes we use are non/low toxic, whilst being durable to the elements. This is good for the environment, and the children playing on the finished timbers. For NBP high quality and innovative design is paramount to our business. We produce quality projects, using handcrafted techniques, that meet and exceed regulatory requirements for Nature Playgrounds. Our Nature Spaces are innovative, founded on ongoing research and analysis to maximise outdoor play and learning benefits to the community, and ensure continual improvement of our business, products and services. 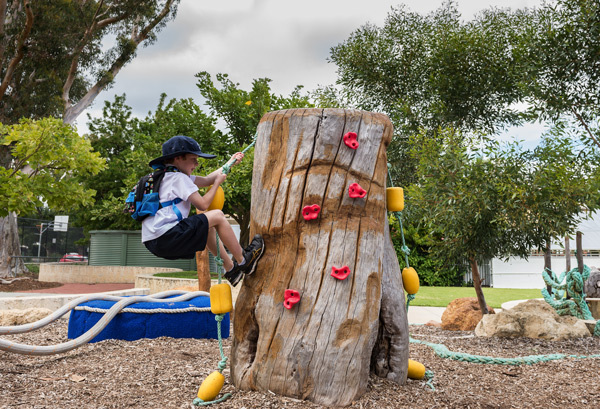 NBP is committed to conducting ongoing research into the benefits of the Nature Based Play, to analyse and report on kids’ wellbeing outcomes, and overall benefits to the local community and schools of our Nature Scapes. As part of our ongoing relationships with clients and projects we initiate research into measuring the benefits to children utilising and enjoying the Nature Spaces that we design. 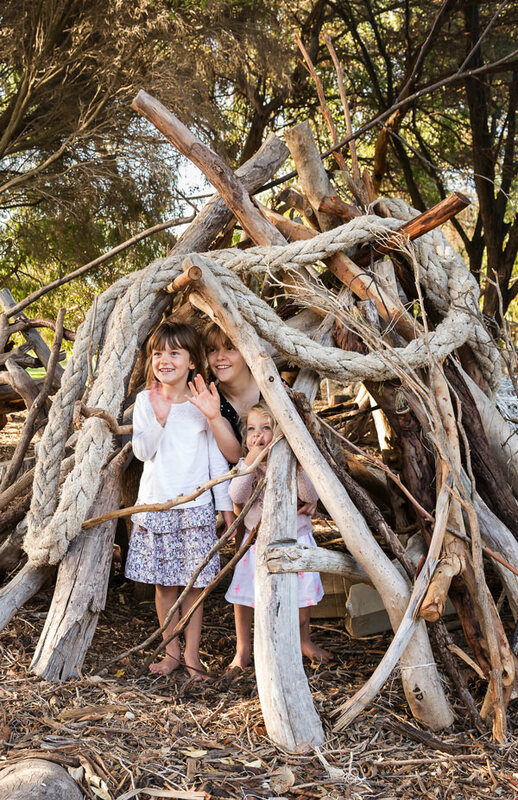 We are currently looking to work with UWA and private research groups, into Childhood wellbeing through the provision of Nature Playgrounds facilities. We also provide a flexible and safe work environment for our employees, with an OHS management system in place, with a supportive work environment for our employees.